President Dianne F. Harrison gives a speech at the 2019 Distinguished Alumni Awards on April 13. 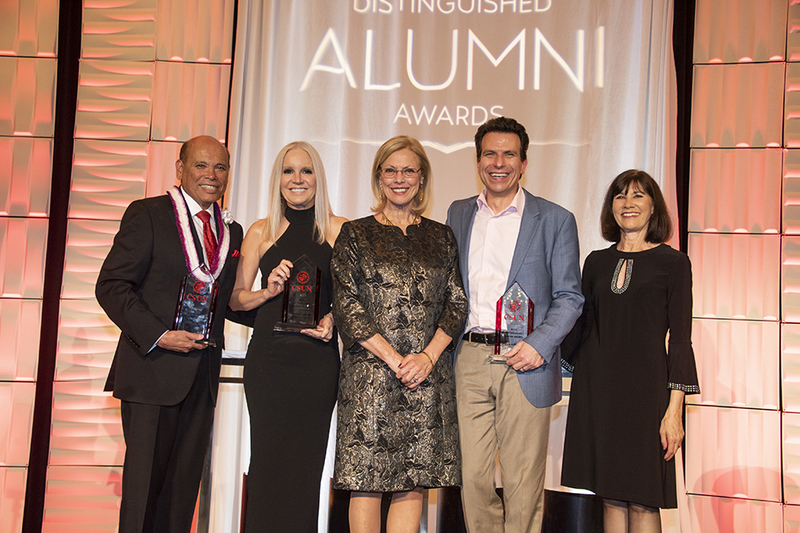 Milt Valera, Michelle Vicary and Andrew Anagnost are CSUN's 2019 Distinguished Alumni Awards honorees. California State University, Northridge Distinguished Alumni Awards emcee and acclaimed financial journalist Bill Griffeth ’80 (Journalism), Hon.D. 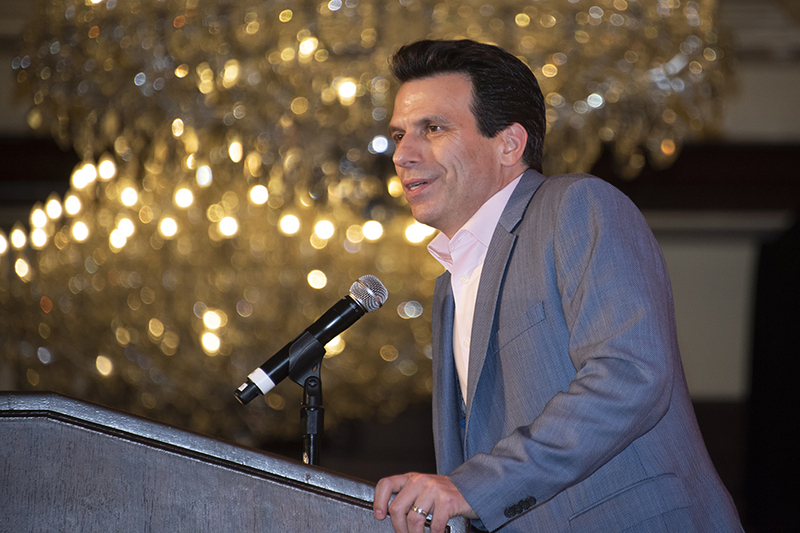 ’17, remarked after hearing speeches from Andrew Anagnost, Milt Valera and Michelle Vicary that each honoree could be the subject of a Hallmark Channel movie. Each speech provided a feel-good, triumphant story perfectly fit for the channel’s programming. Though their time in the classroom was separated by decades, the evening’s three honorees all shared common experiences that highlighted the power of mentorship, hands-on learning and leadership opportunities as undergraduate students at CSUN. Vicary ’08 (Cinema and Television Arts), who has shaped Hallmark Channel’s content as executive vice president of programming and network program publicity for Crown Media Family Networks, agreed with Griffeth’s assessment. And she took the notion a step further about her alma mater. 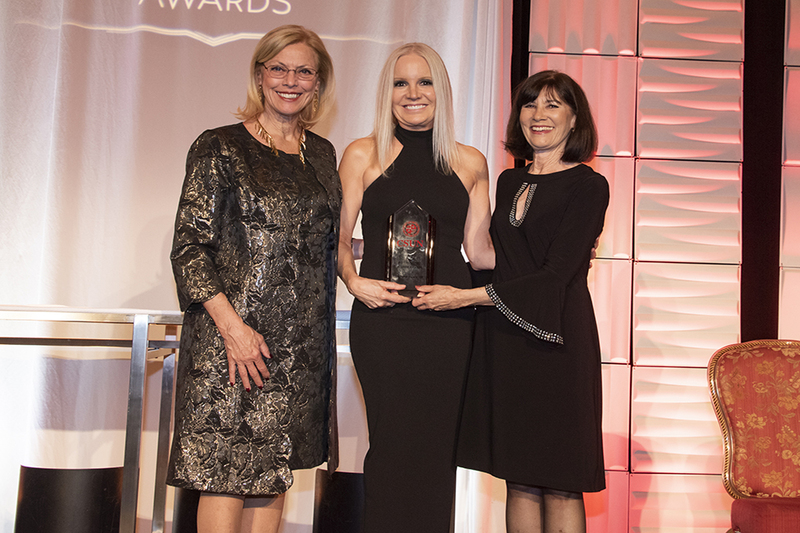 Anagnost, Valera and Vicary were honored on Saturday, April 13, at CSUN’s annual recognition of three alumni who personify the university’s tradition of excellence and who bring distinction to themselves and to CSUN through their outstanding achievements. 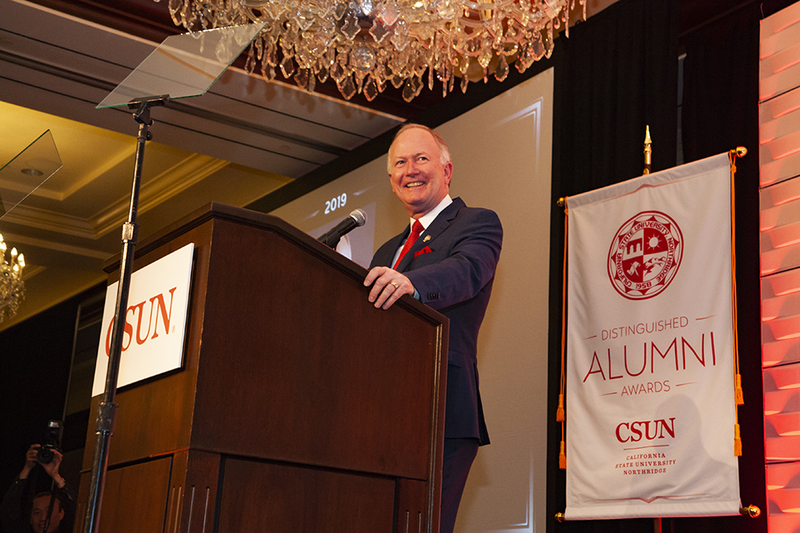 Each honoree spoke of humble beginnings and a deep appreciation of their time at CSUN, which ultimately launched each into the stratosphere of their respective industries. Anagnost ’87 (Engineering) came to CSUN in search of direction, having dropped out of high school. After completing his undergraduate degree, he would go on to earn a master’s degree and doctorate from Stanford University, work at the prestigious NASA Ames Research Center, and ultimately attain the role of president and CEO of design and make software giant Autodesk. Valera ’68 (Journalism) dreamed from afar in Kauai, Hawaii, about the possibilities that awaited him on the mainland. 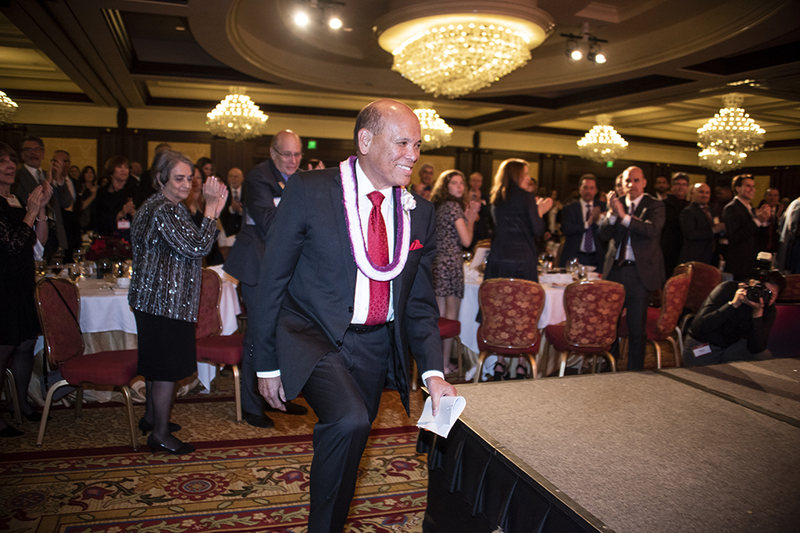 He earned his degree at CSUN and would rise to become one of the most important figures in the history of the notary field as the longtime president and CEO and now chairman of the National Notary Association (NNA). 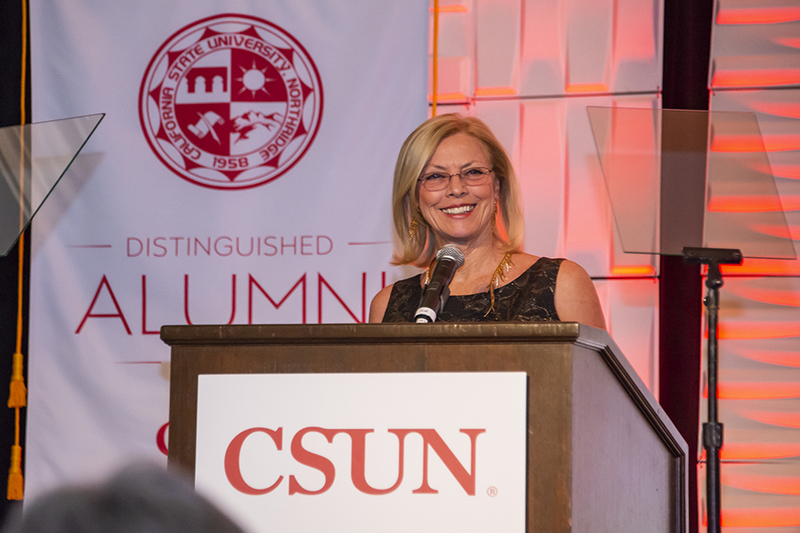 Vicary’s path at CSUN included a hiatus when she left to launch her professional career. However, she returned to CSUN to finish her degree, and is now one of the most successful executives in cable television, overseeing programming on four channels — the Hallmark Channel, Hallmark Movies and Mysteries, Hallmark Drama, and Hallmark Movies Now. Anagnost was the first honoree recognized and spoke about CSUN professors who inspired him. They fueled his interest in fluid mechanics, encouraged him to pursue leadership positions with engineering clubs at CSUN and gave him the confidence to continue his studies and apply for graduate school. After his education, Anagnost began working at Autodesk in 1997 and has held numerous leadership positions at the Silicon Valley-based tech giant, helping to advance the multi-billion dollar software maker to one of the most admired companies in the world, according to Fortune magazine. “These were some of my guides,” Anagnost said of his professors. “Guides that were so important because life is a continual process of dreaming, struggling to make dreams come true, and ultimately having to wake up to your reality. Valera also found possibilities at CSUN. He spoke of living in a sugar plantation community as a child and longing for the opportunities away from the island. He was a husband and father while at CSUN, then known as San Fernando Valley State College. He described the university as a nurturing, family environment, where professors cared deeply about the success of their students. That environment helped build a can-do attitude in Valera. After starting a public relations agency, he ended up working for one of his clients — the National Notary Association (NNA), where he has now worked for 50 years, transforming it into one of the world’s most influential notary organizations. Valera is largely responsible for shaping the notary industry’s education, standards and best practices. Valera has also been a beacon among volunteer leaders at CSUN. He and his wife Debbie are President’s Associates and Heritage Society members who support journalism, the arts, student scholarships and numerous other causes. Valera has served on boards for the CSUN Foundation, The Soraya, the Mike Curb College of Arts, Media, and Communication, the Nazarian College, and the Alumni Association. Vicary included humor throughout her speech and also spoke about professors who made a wide impact on her career. Vicary has been recognized as one of the most powerful women in television for elevating Hallmark Channel’s brand and making it one of the most watched networks on cable. This year, she will oversee 100 movies, four series and one docuseries. Vicary mentioned CSUN’s reach in her speech, and how she runs into many in the entertainment industry who proudly tell her that they, too, are Matadors. “It’s incredible, the pervasiveness of success of the people who go to Cal State Northridge. I’m constantly reminded of it,” she said. Vicary closed by speaking to the group of students in the ballroom, offering advice for their future.